Michael Sulsona, 62, served as a US Marine in Vietnam, where he lost both legs in an explosion while on patrol. Some forty years later, it was not the VA that fixed his worn-out wheelchair, but employees at a local store. For the last two years, decorated Vietnam veteran Michael Sulsona has been petitioning the Veterans Administration for a new wheelchair - to no avail. Then, during a visit to a hardware store on Staten Island, New York, the rickety wheelchair finally broke down. “I knew I was stuck and couldn’t go anywhere,” he told the New York Post on Wednesday. An employee nicknamed ‘Sal’ quickly came to Sulsona’s rescue, doing what the VA had failed to do for two years. Working off the clock, three employees, “David, Marcus and Souleyman,” went to work on the wheelchair, getting it back in working condition without recompense. "They said, 'You're not leaving till it's like new again,'" Sulsona recalled, as quoted by AP. The next day, Sulsona wrote a letter to his local newspaper, the Staten Island Advance, to express his appreciation to the employees. "No one needed permission, there were no forms to fill out, no incident reports, they just saw a guy in trouble and helped," he said of the three workers. 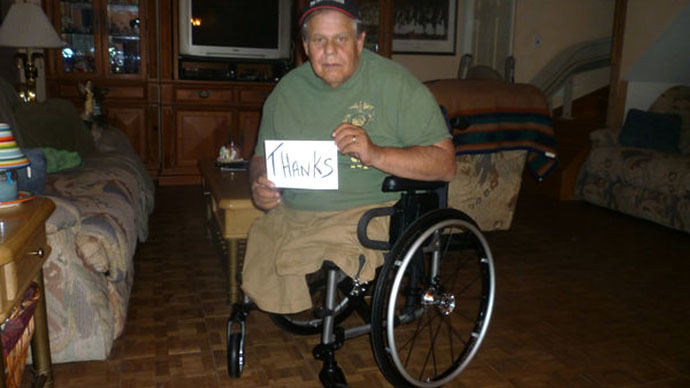 After his letter attracted attention, the VA delivered him a brand-new wheelchair. The VA released a statement on Wednesday offering apologies for the delay. "Too many veterans wait too long to receive their health care and benefits and this has never been acceptable," it read.